Broccoli is one vegetable that I personally dislike. I’m not a huge fan of its taste, and honestly it makes me uncomfortable when someone offers raw broccoli for munching or in a salad. In Philippines where I grow up, I haven’t seen broccoli or tasted dishes with broccoli in it, so it was kind of intimidating to consume this veggie when I came to the US. 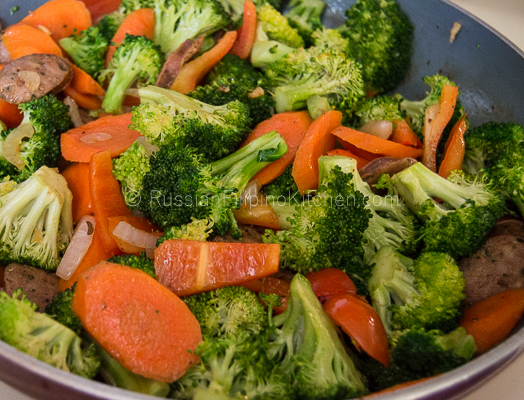 When my second child started eating broccoli from a Chinese takeout, I was encouraged to try cooking more broccoli dishes, experimenting with different flavors to make this bland veggie appetizing to eat. This quick and easy recipe is an example of that. 1. 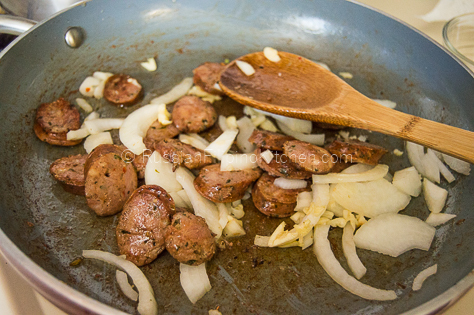 Heat oil on skillet on medium high and sauté Italian sausage until it browned a little, about 3-4 minutes. 2. Add onions and garlic and sauté until onions become translucent and garlic has browned a little, about 2 minutes. 3. Add carrots and cook for another 3 minutes. 4. 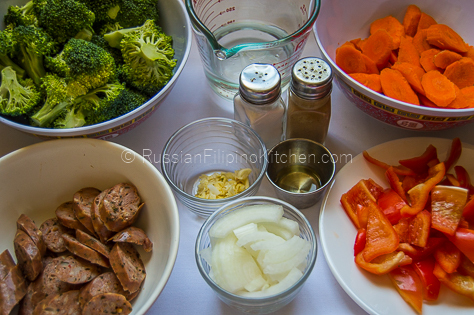 Add broccoli, bell peppers, salt and pepper and mix the rest. 5. Add water and cover the skillet. Cook for 5 minutes. The result will be slightly crunchy veggies. If you want it much softer, cook for additional 3 minutes. 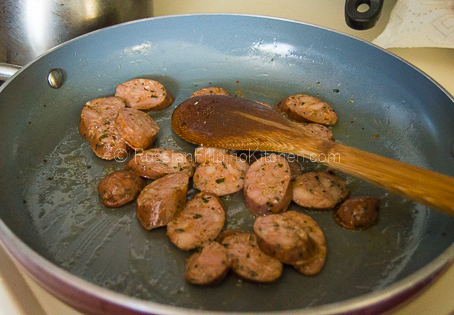 Heat oil on skillet on medium high and sauté Italian sausage until it browned a little, about 3-4 minutes. Add onions and garlic and sauté until onions become translucent and garlic has browned a little, about 2 minutes. 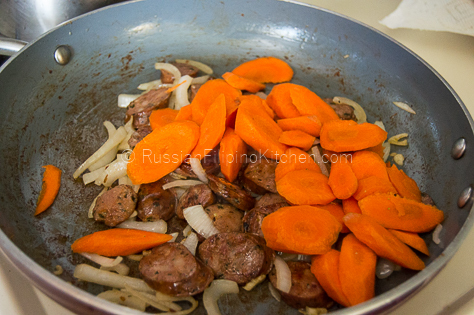 Add carrots and cook for another 3 minutes. 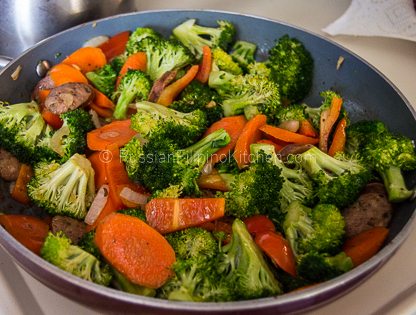 Add broccoli, bell peppers, salt and pepper and mix the rest. Add water and cover the skillet. Cook for 5 minutes. The result will be slightly crunchy veggies. 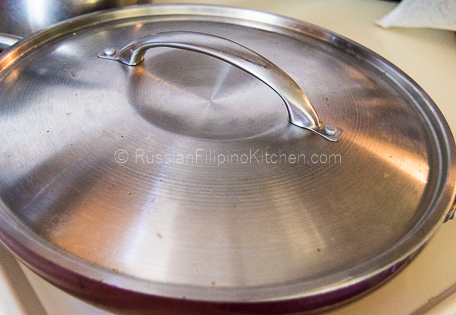 If you want it much softer, cook for additional 3 minutes.